Martin Professional, Kollision and Transform Architects have wrapped the Confederation of Danish Industry building in an ever-changing LED media façade. There are also new lighting schemes for the reception, conference hall and elevators. The media façade incorporates 4,000 meters of Martin Professional’s new VC-Strip in a customized outdoor version, forming a harlequin pattern across the entire façade on which a variety of graphical designs can be displayed. The LED strips are full-color RGB LED battens with each LED (over 90,000 in total) individually controllable in terms of color, brightness and intensity. Content for the façade was created by Danish design firm Kollision in cooperation with Transform and allows the Confederation of Danish Industry to use the facade as a dynamic interface between their brand, the building, and the urban setting. Various facade designs are run from a custom made player-system also developed by Kollision. The system gives the client’s internal communication department the freedom to transmit any look or expression they wish onto the facade. The player-system also includes an integrated weather service app controlling the brightness of the facade. The client can also control and adjust the façade via a custom iPad app. Relinquishing control of the architectural design through the player-system does not scare architect Lars Bendrup: “I look forward to seeing what others will do with the exterior look,” he says. This was Lars’ first experience with dynamic media façade lighting, and his first experience in working with Martin Professional. “We cooperated with Martin on a solution from the start, even before we decided on the LED solution. It was tremendously good to work with them and they had the knowledge needed to integrate LED lighting into this project,” he says. 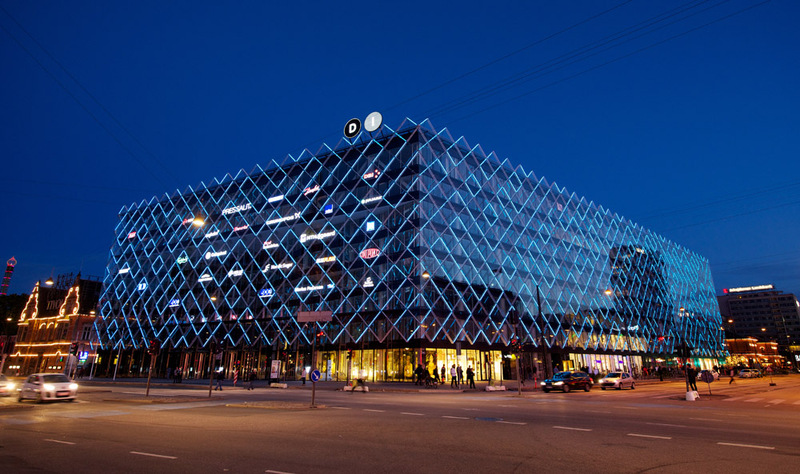 The DI media façade, which went live on May 6th, is the first of its size and kind in Denmark. “This is perhaps the most ambitious media façade integration in Scandinavia and signals a change in the architectural landscape,” Lars states. Other areas of the Confederation of Danish Industry building have also been outfitted with new Martin Professional lighting systems, including the conference room with 60 Martin moving head luminaires and Martin LED strips; the reception area with strings of LED dots; and five elevators at the main entrance, where each floor interactively sets its own light level and color temperature; a complete Martin reference, both inside and out. The main contractor on the Confederation of Danish Industry renovation project was E. Pihl & Søn.